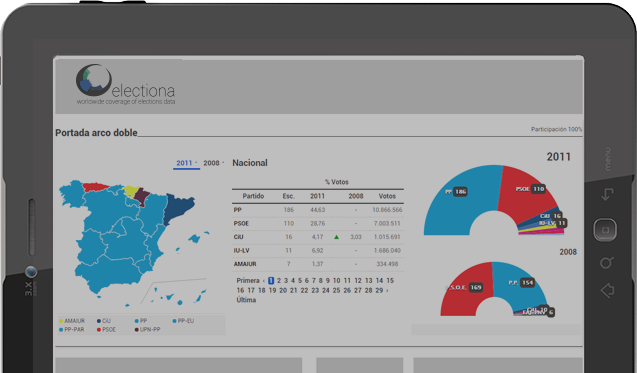 Electiona Widgets is an online graphic service, that allows you to integrate on your website, quick and easy, electoral graphics related to Spanish electoral processes. Election Widgets will give you electoral graphics updated the day after election day, for every Spanish electoral process. It also offers historical graphical electoral information and comparison with every other electoral process of history of Spanish Democracy. Electiona Widgets is a graphic library that allows the integration of a huge pool of electoral graphics from the begining of Spanish Democracy, with a level of detail that includes each town. Electiona Widgets also adds to the graphic library every new electoral process after it is over, allowing you to include that info quick and easily. It also includes useful documentation with many easy examples to integrate these calls, without the need to have an advanced technical knowledge for it. Electiona Widgets architedcture is based on open source solutions and standard technologies. Read more about Electiona Widgets, available modules and how easy the integration is, with a practical example you can try now.